There’s a company in San Francisco that’s taking the very old business of custom jewelry making and making it modern. How, do you ask? Well, by transforming it into a startup, of course! Diamondere was started by two cousins who grew up in the jewelry industry. Their family originally started producing beautiful pieces way back in 1890 for royalty, celebrities, and dignitaries. That small-production, custom-only tradition evolved with the times, until their family was mass-producing jewelry for high end lines around the world. Keeping with that tradition of changing with the times, the two cousins decided to draw on their family’s years of experience to bring the company firmly into the 21st century. 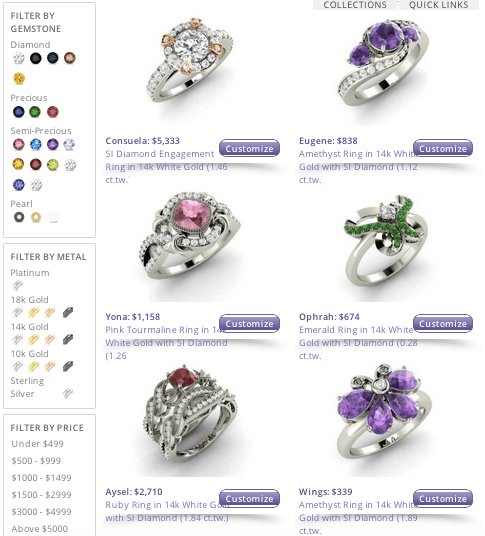 Utilizing cutting-edge technologies like 3D printing, computer aided design, and 3D videos, current Diamondere customers are now able to fully customize their jewelry. The can choose to either draw on the company’s collection of colored diamonds, gems, and precious metals or work with a Diamondere professional design to create beautiful work that meets their needs – and their budget. The company also offers a one -ear warranty on their jewelry, covering any manufacturing defects. They’re willing to stand behind their work and promise to replace any piece that was produced with a defect. The gem industry took a pretty bad publicity hit over the past twenty years, as the conditions in countries where they were mined were exposed. People learned about forced labor, terrible civil wars, and the word “blood diamond” entered the common lexicon. Diamondere, however, only sources gems from conflict-free mines, so you can rest assured that the symbol of your undying love wasn’t involved in anyone else’s death. We buy jewelry for a million different reasons: to express love, to buy a favor, to make ourselves feel good, to mark an important event. That uniqueness of those reasons should be matched by a uniqueness in the jewelry itself, and it shouldn’t cost anyone an arm and a leg, literally or figuratively. Diamondere – a company whose work and design was previously only available to the top echelons of society – is now accessible to folks like you and me, thanks to the wonders of technology. So if you’re searching for the perfect engagement ring, graduation present, or just something to brighten up your day, check out Diamondere for beautiful, conflict-free jewelry fit for a queen.